The CD begins gently with “All the Pretty Horses,” based on a traditional folk melody. Meditative and reflective, it’s a very calming piece. “East At Sunset” continues the peaceful mood simply but very colorfully. “40 Days of Desert” is darker, more somber, and has a mysterious cast to it. “What the Stars Saw On the Prairie” is serenity set to music. It is easy to visualize a gentle breeze blowing through the long grasses - a simple pleasure with no rush or pressure anywhere. Love it! “Something Water, Something Light” picks up the tempo and dynamics, creating a swirling dance of motion and light. “Hymn For Peace” goes inward and conveys a simple but passionate plea. 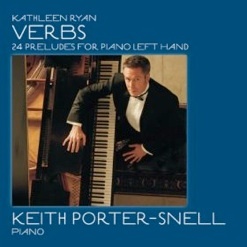 “Veni Creator Spiritus” is from a traditional melody that Ryan imbues with quiet spirituality and a classical style. Open and simple at the beginning, the piece builds to a peak with each variation and quiets to a whisper by the end. “First Only Whisper” is my favorite track. Built around several themes, the piece has a feeling of deep introspection and quiet passion. At almost 8 1/2 minutes, “Bells, The Veil, and Victory” is by far the longest piece on the album. A recurring theme evolves as the piece develops, going from subdued to very big, bold, and triumphant. “Simple Love” is based on a traditional melody, and conveys a sweet but very powerful emotional message - another beauty! 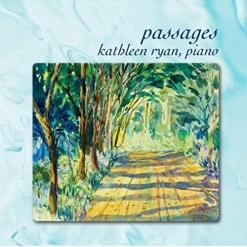 The title track closes the CD as it began, quiet and tranquil. 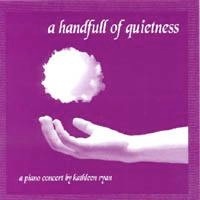 A Handfull of Quietness is a fascinating musical journey, reflecting a wide range of moods and emotions. The music has a complexity that will open up with each listen, letting you find something new each time. 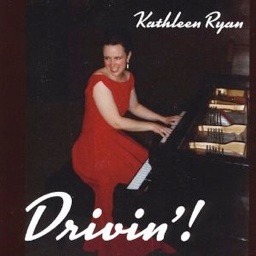 It is available from kathleenryan.com, cdbaby.com, and amazon.com.